New neighbors — Rusty and Timber! 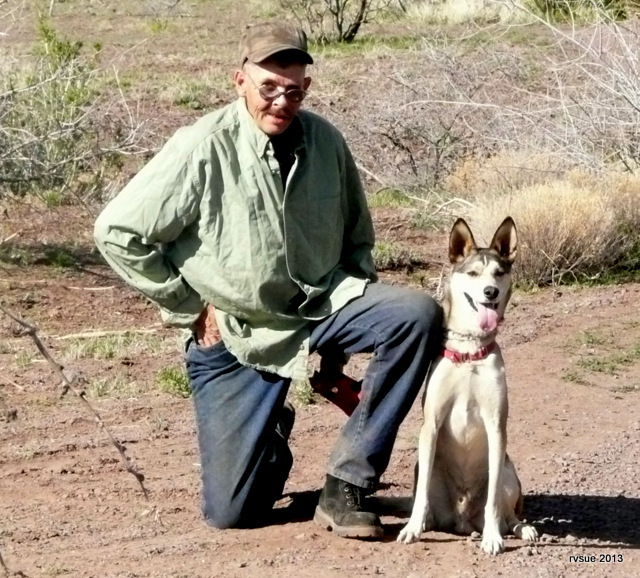 For those of you new to my blog, I met Rusty last spring when we both were boondocked near Ash Fork, Arizona. You can get to know Rusty and Timber better by reading about his days as a mountain man walking with his donkeys. You can also read and watch the television video about last year’s tragic loss of Timber followed by the amazing events that led to a heartwarming reunion. Rusty and I keep in touch by email. I promised that the crew and I would visit him sometime this spring. That’s why we’ve been moving our camps northward in the general direction of Prescott National Forest where Rusty camps at this time of year. As it turns out, Rusty needed to move in order to follow the 14-day limit rule, so he asked if he could join me and the crew at Juniper Hill Camp. We have a lot of catching up to do, mainly me catching up on Rusty’s news, because my life is, well, an open blog, and Rusty follows this blog, commenting often. Rusty went through a bad spell recently, which caused him to visit the VA hospital for tests. They discovered he has a leaky heart valve. He is carefully following doctor’s orders to maintain a low-fat, low-salt, heart-healthy diet, and to limit his caffeine intake. Timber is excited to see Bridget and Spike again. Maybe in a few days, all three will settle into a calm co-existence. Apparently the divide between rat terriers and a husky-malamute-german shepherd-mix is ver-r-ry wide. Plus there’s that male, terrritorial dynamic going on. Bright and early this morning the crew and I motor down the highway to Many Trails RV in Prescott Valley, the PTV towing the BLT to have her toilet flush pedal fixed. We arrive ten minutes early for our 8 a.m. appointment, just enough time for me to walk the crew around the neighboring businesses and back. While setting up the work order in the office, I notice the sign that says labor is $98 an hour. Gulp. Yesterday Rusty suggested I have the power cord outlet moved to the bumper, instead of having the bracket replaced below the bumper. 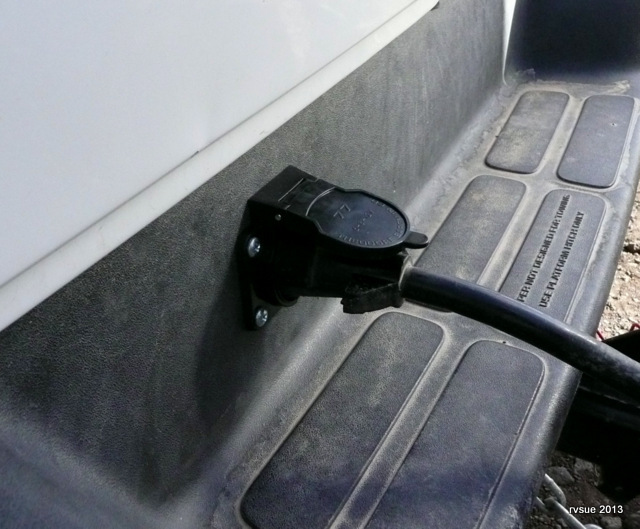 This would eliminate the potential for future damage and would prevent the cord from rubbing on the pavement. I have that job added to the work order. The labor for the toilet repair: $9.80. The labor for moving the power cord outlet: $49.00. The new 7-way plug end: $8.95. I’m very pleased with the power cord raised up like this. Bridget and Spike are exceptionally well-behaved in the waiting room. Other customers notice and compliment them. I make a mental note to reward them later. Many Trails RV has a free dump station. Not only is it free, but a man immediately appears and takes care of the dumping! He also helps me fill up the fresh water tank. I take advantage of their dumpster, getting rid of my personal trash, as well as the trash picked up by Rusty and myself from the forest road where we’re camped. I stop at Safeway on the way home. I pick up a quarter-pound of roast turkey slices at the deli, a special reward for the crew. Once the groceries are stashed in the BLT, I join Bridget and Spike in the PTV and dole out bites of roast turkey until their happy, little faces have downed every bit of it. Bridget and Spike sleep all the way back to camp. 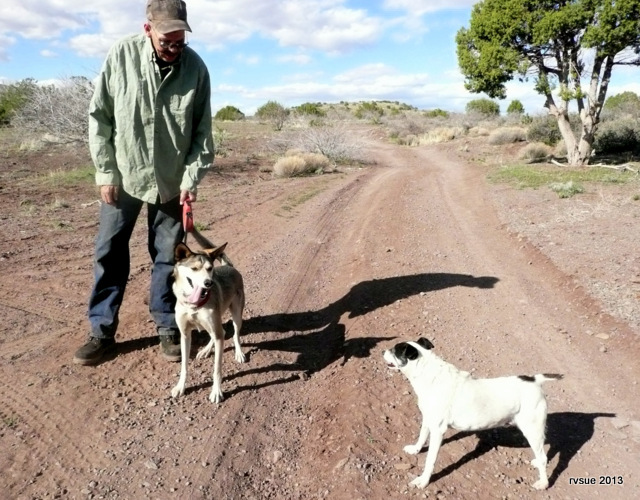 This entry was posted in Simple living and tagged boondocking, casita, dogs, Many Trails RV, Prescott National Forest, Prescott Valley, rat terriers, Tow vehicle, travel trailer. Bookmark the permalink. 98 Responses to New neighbors — Rusty and Timber! i’m wishing you both a very happy visit, and blessings on all three precious pups! What a pleasant post. Gee, that sounds strange but it is the truth. You can make every day things sound so……..well, so pleasant. Yeah, we got lots of pleasant around here! 🙂 Love ya! Sounds like a great two day! New neighbor and all repairs taken care of at a very reasonable price. Hope Spike and Bridget warm to Timber! Enjoy your beautiful, peaceful desert. For people who do their own repairs, it may seem like a waste of money. For someone who doesn’t want to bother with it, the price is great! I expected the charges to be much higher. Anyone who frequents or lives in the Prescott Valley, AZ, area take note: Many Trails RV on Hwy 69 — five stars! Moving that power cord connection up was an excellent move. You will wonder why it took so long to think of it. Once again you have proved your superior RV judgment. Make sure there is enough slack for a sharp right turn without stressing the plug. I’m already wondering why I didn’t think of it and why I didn’t think of it sooner. There’s plenty of slack. Moving it up that much keeps the power cord up enough that I don’t have that worry of it being damaged on the pavement. I was bungeeing it up which is lame. Hey! Great to see Rusty and Timber again. I’ve been wondering when you guys would meet again. That Timber loss and recovery was no fun to live through for Rusty, Timber and yes AZ Jim too. Sorry to hear about the heart situation though. I hope that works out ok for him. You did very well on the repairs and I approve of moving the power takeoff like you did. Enjoy each others company and your crew(s) as well. Blessings….. Always nice to hear from you, Jim. Blessings to you, too. Heehee…sounds like turkey works to put doggies to sleep as well as people?? Haha! And without the pumpkin pie with whipped cream! Ah geez, now ya got me craving pumpkin pie with whipped cream. Thanks alot! NOT…lol. Notice I did not say craving turkey…eat dessert first! Eat dessert first and you ALWAYS have dessert, right?? Glad the problems are all fixed and you are getting to visit with Rusty. In 1993 I and four other women started an animal rescue organization. It has grown a lot since then. Web site is. lakefieldanimalwelfare.org. Animal Welfare is a large part of my life. Was thinking of Timber, and Rusty’s health issues. Wondering if Timber has any ID on his collar or a phone number in case of emergency. Just a thought. Good for you, looking out for the welfare of animals. Timber is one beautiful dog. Effie would be like Bridget…too close for comfort. Glad your repairs didn’t break the bank. That is easy to do now days. Timber is gorgeous. 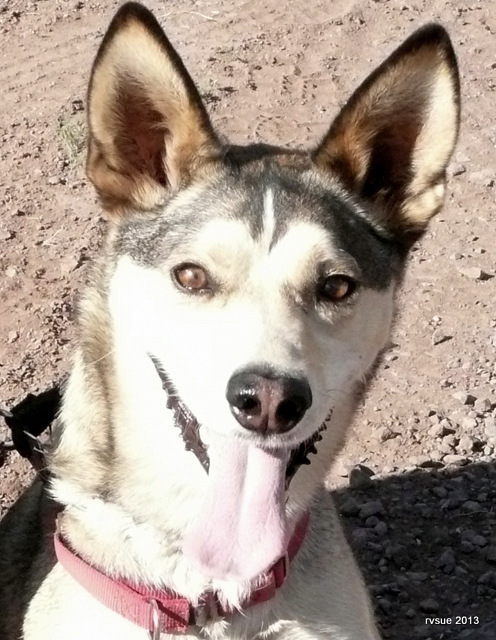 That little sliver of white on his forehead is what confirmed he was Rusty’s lost dog. So happy to see Rusty and Timber again. I’m glad you found us, Carolyn. I know many readers care about Rusty and Timber so I’m happy to share us seeing each other again. Great to see Rusty and Timber again. Timber, your getting to be a big boy and scare poor Bridget, not Spike though. Have a fun reunion. Spike and Timber get along fine, as long as Timber doesn’t get too friendly with me. It’s the difference in size, temperament, and age that makes it hard for them to relate, kind of like people! Hey Sue,More former Georgians her,Trip and Lisa now in North Dakota part of the year. I have some heart issues myself and got the same instructions as Rusty,so my 86 year old mother sent me a case,that’s right,an entire case of “Janes” which is no salt,,,salt,as I call it and it’s great and “0” of everything in it,lol. You have our email there so send us an address and we’ll put a couple in the mail this week for you and Rusty. Nothing better than great health and making the heart healthy. Rusty may set up a mailing address sometime in the next few months. Let’s wait until then. That’s a very thoughtful offer which I’m sure Rusty will appreciate (He’ll see your comment.) You may have to remind me! Best wishes for health for you both. I can’t wait till I have old RV friends to hook up with again.Once I am able to do some rving It will happen. It really is true that Rv folks are the friendliest group and kind hearted. I’m still in Texas waiting on the baby. She was due the 1st but apparently is being stubborn and not cooperating. I should be heading out around the 15th to wherever my heart desires. It is so great being an RVer, because every road leads to home. So good to hear about Rusty and Timber and you getting some time to catch up. I think your repair costs are very reasonable. Heck, for that price I wouldn’t of tried to fix the toilet either. “Every road leads to home” — I like that! Well, babies have their own timetables. Your niece must be tired of this waiting game. That bill was good news. I about lost my breath at $98 an hour for labor! Timber is a good name for Rusty’s dog. Reminds me of Call of the Wild by Jack London.. My toilet went out awhile back and it cost me $192.00 even with a senior discount for a new one. With the money you saved you and Rusty can whoop it up and dance around the camp fire. It’s good to see what Rusty and Timber look like after hearing so much about them. I love his truck and camper set up. Beats living in a tent packed on a donkey. But donkeys are cheap compared to the high gas prices now days. I urge you to click on the links above, especially the one about national news. It will take you to a link for the video that was broadcast on the television news. You’ll feel like you’ve met Rusty and Timber in person after watching it. Rusty’s camper is a marvel. 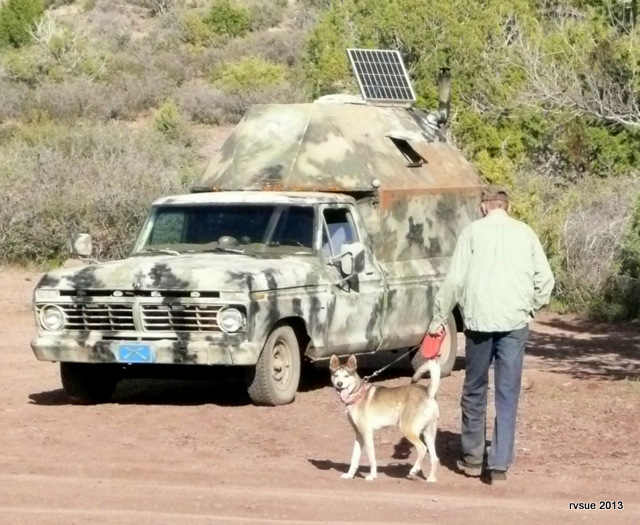 You can see the pipe from his wood stove in the photo and the solar panel that swivels. The camper is aerodynamic, too. And another advantage of a donkey over a vehicle… A donkey can be a friend! Glad to hear everything worked out! Me, too. Always a relief (in more ways than one!). What a great post! As soon as I saw the title I was smiling! Rusty and Timber look great! What a great reunion for you guys! Spike, Bridget and Timber will settle down…they were probably amp’d up because Rusty and you were amp’d up….it’s been so long since you’ve seen each other. The new location of the power cord should be well protected when you drive on the back roads of Morocco. Yikes from the sound of it…..that was VERY primitive! Curious as to what the “local” sign read. It only took a nanosecond to fix the toilet. Did he show you how to fix it …in case it happens when your out in the middle of nowhere? Us girls have to have their toilets in working order…cuz once they are on the blink…for some reason we have to pee every five minutes! I’m glad all of the repairs didn’t cost an arm and a leg. Have a wonderful visit with Rusty and Timber. Oh, that local sign said something about taking the “cutoff” instead. Huh? What cutoff? I was not in a frame of mind to play games with a cryptic road sign. I knew the day would come when I’d find myself in the PTV towing the BLT on a narrow road with ruts too deep and rocks too sharp and high. That’s part of the risk of searching out new boondocking sites. We survived with minimal injury! I didn’t watch the repair, mainly because I had the crew in tow, they were settled down in the waiting room, and I’ll take the chance that the next time that cable comes loose, I’ll be able to open the flap and figure it out. Sometimes I’m a great can-do person. Other times I’d just as soon not bother myself with learning something uninspiring like toilet repair! Thank you for the sweet wish… I am enjoying conversations with Rusty while sitting by the juniper tree. Kudos to Rusty for suggesting you move the power outlet to bumper! 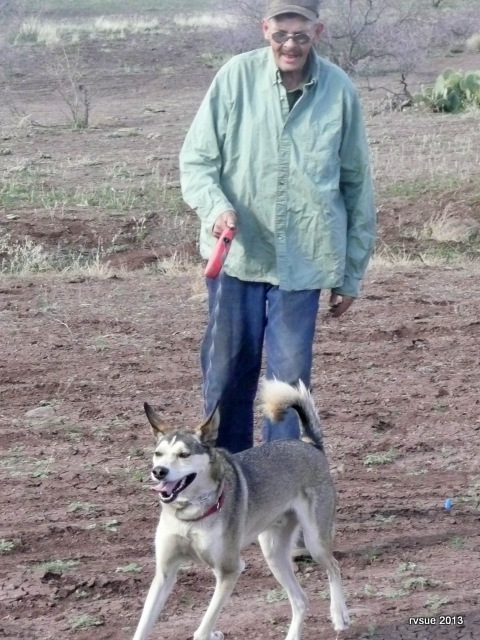 Oh, my German Shepard did not get along with little dogs….don’t know why…otherwise she was the sweetest, lovable, smartest, mannerly dog we had. She learned commands quickly, loved to play Frisbee, play catch, etc. She also learned to cover her water & food dish with her toys so pigeons didn’t bother it. she’d uncover it when she wanted a drink or eat. She lived with us for 14 yrs & quietly passed away. She was so old we carried her around & I’d take her out in a wagon to hike or walk in the park. I still miss her. I thought repairs would be so expensive but turns out it was minimal. Glad everything turned out great & have friends who will enjoy walks with you all. What an intelligent and clever dog! It must have been extremely painful to let go after 14 years of loving each other. The spirit of special pets stays with us forever. (I still feel the “essence” of my childhood dog, Prince.) Your dog obviously had a wonderful life and was an important family member. WONDERFUL WONDERFUL!!!!!! I knew by your moves you was closing in on Rusty and Timber. I read that story, and I cried. I was so happy as was many that you help bring Timber and Rusty back together again. A leaking heart valve is no fun. I have dealt with my son’s Aortic valve for twenty eight years (since he was born). Please give Rusty my best and let him know I have added him to my prayer list. Your repairs cost was awesome. Congrats for finding a good reasonable place for service. That Spike! He seems so outgoing while Bridget seems to be more the momma’s girl. I love them both and haven’t even met them! Have you explored the Virginia City Montana area? I have been researching the area and a cousin told me he visited the area in the 70’s. He said it’s a ghost town and appears like everyone just up and left fifty years ago and never came back. I think we are going to explore the area. Again, you have brightened my day. My patience batteries have not had sun to recharge them and today, they, well – died. Your Blog has provided a bit of alternative charging supply. Thank you! Give my regards to Rusty, and that beautiful buddy Timber if you will. Please give Spikey and Bridget a hug and kiss as well. They are so adorable. Enjoy your camp, it’s sure looking peaceful. Thank you for sharing your life RVSue. Hi, Kay… No, I haven’t explored Virginia City. I hope to see more of Montana this summer. I fell in love with Montana and Wyoming. It’s nice to know my blog recharged your patience batteries. Thank you for your kind words. Rusty will read your comment to him and Timber. Kay, I decided to chime in here when you mentioned Virginia City, MT. I live generally in Montana and have been there a few times. Very touristy in the summer but there are residents who live there year round. It’s great in the summer because some of the residents dress up in old fashioned clothes and stroll the streets. You can even buy clothes including petty coats. It’s a great place to spend the day. It’s also an area rich in history because of vigilantes and such. I go hounding for garnets there too although I’ve never found the one that’s gonna make me a millionaire…lol. You can also visit Nevada City, MT which is on the way to Virginia City, it’s not occupied but has restored town buildings which were brought in from all over the state as far as I know. Very cool. Plus there is a train you can ride through the area. Also visiting Ennis, MT which is nearby is cool. It’s a trout fishing mecca with an old meets new west kinda charm. Ok, so much for the tourism brochure…lol. Sorry for hijacking your blog comments Sue. Now back to your regularly scheduled programming…..lol. I don’t consider your comment a hijack… rather very informative and interesting. The crew and I were in the Ennis, MT area last year. Love the Madison River! Thanks Sue. Yes that river is beautiful winding it’s way through the valley. I’m also fond of the Lochsa River on the Montana/Idaho border. How great to see that you caught up with Rusty and Timber !!! Love seeing them. Thats not to bad for the toilet fix. Looks like a nice camp ! I hope the doggers getalong !! Hi Susan . . .The crew and Timber get along. They’ll forge a friendship over the next few days. Yes, it’s great to see Rusty again. Glad you got in and out without it costing the farm. And how nice to visit with Rusty and Timber. Yes, it all turned out well. That $98 an hour sign made me nervous. Kudos to Many Trails RV for the fair pricing and good services you received. Kudos to you for being such a kind person & good friend. Glad you got everything fixed and you have a new neighbor! Life is good! Yes, life is good, especially under blue skies with a friend. How fun to see Rusty & Timber again! Hope all the pups will work things out & you will all have a pleasant visit! We’re enjoying life. Nice to hear from you again, CT. 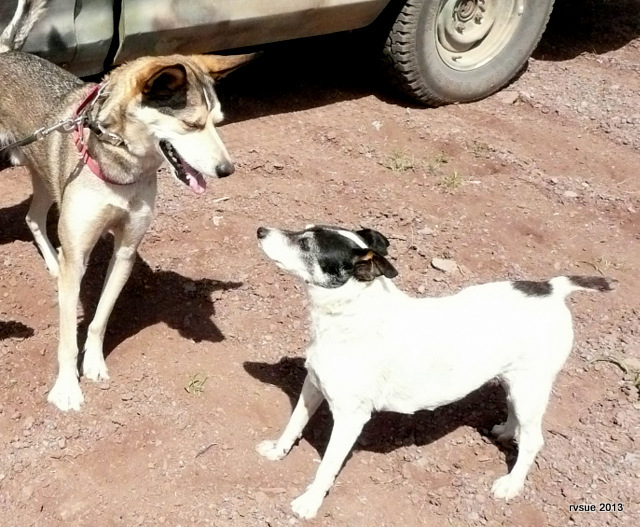 So happy to see Rusty and Timber – what a smile on Timber! Makes me happy just seeing his happy face! Enjoy your time with R&T! You’re right about Timber. He has the kind of face that lights up! Hi Bev . . . All the collie pups were named Timber? I guess that does make it a special name for you. Yes, two labs would make wonderful pals for Timber. Bridget and Spike aren’t the type to romp and rumble with another dog. Too sedate . .. like me! So good to see Rusty and Timber! Please give them both an extra hug around the neck from Geri and Chuck. We will be taking the MotherShip in for a looksee soon and hope we get off as cheao as you did. Chuck and I have decided to go to Mesa Verde sometime this May! I wanted to put that bee in your bonnet in case you wanna join us! Hmm . . . I’ll get out my Benchmark atlas . . . I bet Rusty will read your thank you to him, if he hasn’t already. I’m sure he appreciates your thoughtful advice. $120 an hour! They’d have to carry me out! I meant to post on RV Service Reviews for Craig Motor Craft in Wickenburg and never got around to it. I appreciate the reminder. I was wondering if you and Rusty were maneuvering closer to each other! So nice to see them both! I am sure you will have a nice visit. My hubby and I will be spending the month of June in Sandpoint, Idaho. On our way back we are thinking of checking out Capitol Reef National Park in Southern Utah. It looks amazing! If it is anything like Arches National Park I can hardly wait. Did you happen to go to Capitol last summer? I remember you were in the area. We will be taking our Jack Russell with us, so we may get kicked out of the state of Utah! As for now, we are really enjoying the weather in Phoenix, as I am pretty sure you are doing at your Juniper Hill site. This is the time of year we Arizona residents really look forward to. This weather is beautiful in Arizona this time of year. Rusty and I enjoyed the big, fluffy clouds against the blue sky yesterday. I need to get back outside! The sunshine is luring me. Good travels to all three of you. Jack Russells…hmm… I think of them as Spike-on-steroids! No, I only explored Zion last year. Maybe I’ll do one Utah NP a year. With 5 National parks in the state, that sounds like a good plan. Yes, we are convinced that our Daphne was overdosed on steroids at birth! Capital Reef IS amazing….you’ll love it Joan! I was there when I was a kid (OK, that was more than 30 years ago)…and again in 1990. Really worth the trip. Rusty gives me great ideas where to boondock in the future. I was happy to learn that you had gone to Many Trails to have your work done. 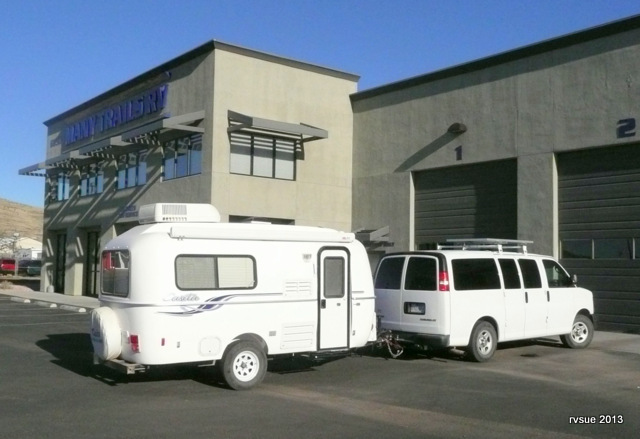 We had extensive work done on our motorhome at this facility when we returned to AZ last Fall and highly recommend them. We “camped” in their parking area with electricity. They made us feel welcome and made sure we were comfortable. We have more non-urgent work to be done and plan to stop there again this Fall. Did you drive by the funky Dental building down the street from Many Trails? What child wouldn’t like that place?! How wonderful to meet up with Rusty and Timber! That will happen again and again as you make your “circle of life” journey. Stay safe…. That sounds like Many Trails RV … all about customer satisfaction. Yes, I saw that dental building for kids. Safe travels to you, too, Bev. I was looking at that outlet thing that broke wondering why it was THERE in the first place. Good job moving that! My dog Junior is great with people and cats… horrible with other dogs. Good luck with your new pack. I love, love, love Rusty’s truck/camper! Must remember to read his articles…. note to self. Peace, Love and Good Camping to all. Good morning, Bodhi . . . I hope you made it through the thunderstorm. When you get back to civilization, do read about Rusty when he was Three Feathers, the mountain man, and watch the video about the Timber saga. Then you’ll want to go back and read how we met! Good camping to you always . . . I also remember Ennis as a nice little fishing Mecca. Great little downtown Main Street atmosphere. Timber is a beautiful dog. I think you and Rusty are BFF after you brought those 2 together again. Best wishes to Rusty with his health issues. He looks like a guy with lots of good campfire stories. Spike needs a guy friend too. Rusty has had an interesting life so far and he’s given me ideas where some good boondocks are. I caught Spike over at their campsite, playing with Timber. Very cute. When is Rusty going to get his home thru the VA? I remember he mentioned it a while back. They both look good. So glad you have hooked up with each other. Computer contact in fun and good, but sometimes you just need face to face contact also. So glad God is taking care of you our there. You are finding the right resources at the right time for just what you need. Rusty is on a waiting list. I’ve decided not to blog about it until he actually has a home. Oh what it would be like…………………………..to be a fly on the wall at your campsite. Hope you are having a great time! Ha! No flies here, just some ants, and you don’t want to be an ant in our campsite! The Timber story is a tear-jerker. Scott Craven and his team did an excellent job with the video. Love the way people seem to “match” their dogs. Rusty and Timber just do. Maybe it’s all the joy folks get from their furry friends. Sue you have made me a faithful follower! I am so glad to “meet” Rusty and Timber. I now have tears in my eyes reading about them. Hi to Spike and Bridget. Welcome, Jan! There’s always room for one more faithful follower. I have a confession and a suggestion… I buy things from time to time from Amazon. My 61 year old memory doesn’t always keep up to my keyboard fingers. After a purchase yesterday I realized I didn’t go through your site; Yikes!!! To fix this terrible oversight I modified my ‘favorites’. I deleted my former link to Amazon and then loaded your site, clicked on the Amazon link, then saved that as my ‘new’ Amazon ‘favorite’. Now, whenever I decide to load Amazon I will automatically go through the link on your site. I hope others will do this as well so we can, in some small way, contribute to keeping you happy on your travels. Hi Barrie… You are forgiven for forgetting to shop Amazon through my blog! I appreciate you wanting to make sure that never happens again. Your comment raised the question in my mind whether it’s okay with Amazon if my sales increase due to bookmarked links. (Amazon is very touchy.) So I’ve submitted that question and hope to receive an okay. I’ll let you know what I find out. It’s probably not a problem. Your thoughtful nature comes through with every comment you make, Barrie. I hope all is well with you and yours. Hello RV Sue, first, I want to thank you for the time and effort you put into this blog, esp with the photos. I look forward to each post. I retired last year. It has taken a full year for me to learn to budget a retiree’s income, but I am doing well. The amount of waste that I personally did was just awful, and it feels good to recognize that and work toward a better simpler life style. I have often packed up my small Scamp trailer and taken off for weeks at a time. I don’t know if I will ever full time, but I will continue to look forward to each and every post…Thank you! You’re welcome, Jessy. It’s worth the effort of this blog to have a connection with many good people who are willing to share themselves and their help. Congratulations on adjusting to your retirement income! And also for recognizing and doing something about wastefulness. It is a good feeling. I do hope you will continue reading my blog. So happy to see Rusty and Timber back! Hope his health concerns improve. ❤ That shop sounds like a stand up place, and it looks like they do good work. As a single woman, I always worry about getting taken advantage of and hearing success stories is always motivating. Tell Spikey & The Bridge, good job on being so good for Mama. My crew is outstanding! I am very proud of the compliments they get when we are out and about. Yes, I imagine it’s rare for a single woman to never have been ripped off at a repair shop. We all have our horror stories. It seems that kind of behavior is diminishing. I attribute that to two things: 1) Women are taking charge of their vehicles, learning the basics about maintenance and repair, and 2) Auto repair shops know that bad business practices may be transmitted across the internet in a blog or reported to a website so complaints appear whenever a potential customer searches for a shop online. What a wonderful visit you and Rusty must be having! I remember reading the blog about him losing Timber, and I cried when they were reunited. I’m delighted to hear you found a reputable repair shop to work on your BLT. Like other commenters, it’s hard sometimes to know, as a single woman, whether the shop people are honest or just taking advantage of our lack of knowledge. I’m taking my first step on my RV journey in a few weeks – I’ve made reservations to rent a 22 ft RV for a week. I thought I’d try out the vehicle and the lifestyle a bit before making a final decision. Plus I need to see how Oliver the dog will act. I’m excited! Now I’m just praying for good weather. Sue, how absolutely wonderful that you are friends with Rusty and I read the article from last year on you helping him find Timber. Bless your heart! Enjoy the remainder of your Sunday. be able to share my personal experience and thoughts online.